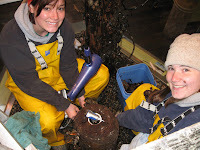 Yesterday Brenda and I spent hours in our piling tank delicately super gluing mussels to the pilings! Who knew we would use so much super glue? Perhaps PTMSC should buy stock in it? 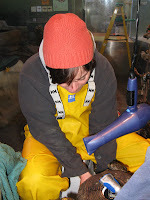 After a successful and creative day we turned the flow back on to the tank and watched all the creatures open up. It's wonderful to see the tank so full of life again! 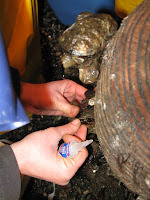 Come check out our giant tube worms and beautiful new mussels when the exhibit re-opens in April!